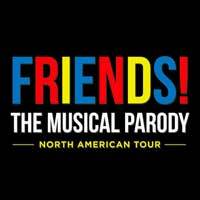 Broadway In Chicago and Right Angle Entertainment announced tickets to FRIENDS! The Musical Parody will go on sale on Wednesday, December 5. FRIENDS! The Musical Parody will play Broadway In Chicago's Broadway Playhouse at Water Tower Place for a limited engagement Feb. 12 - March 3, 2019. FRIENDS! The Musical Parody is the comedic musical that lovingly pokes fun at TV's Friends, celebrating the adventures of your favorite group of 20-something friends as they navigate the pitfalls of work, life and love in 1990s Manhattan. It's a typical day at New York's only coffee shop, Central Perk, until an unexpected runaway bride enters the picture and kicks the whole gang out of second gear! The new musical recreates our favorite moments from all 10 years of Friends through an uncensored, fast-paced, music-filled romp. "495 Grove Street - How Can We Afford This Place?" "The Ballad of Fat Monica"
"The Chick and The Duck Song"
"I am Marcel, the Monkey!" "The One Where We Make a Million Dollars an Episode"